Mike Mancuso started riding bikes when he was 14. He immediately fell in love and was riding everyday. 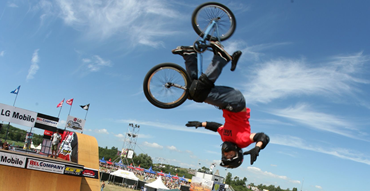 Having won the amateur vert championship title in 1999, he turned Pro in 2000 while finishing his undergraduate degree from East Carolina University. He then traveled the world participating in many contests and tours including Action Sports Association, Vans Warped Tour, Deconstruction Tour, and many others. He was also a competitor in Gravity Games, AST Dew Tour, and X games USA, New Zealand, Australia, Malaysia, and Dubai. Having ridden his bike in over 20 countries and every major city in the US, he gained a well-rounded understanding of the BMX industry and the community that supports it. He envisions his own team of outstanding riders who could deliver awesome BMX tricks with positive messages. Protown BMX was started in 2006 with the motto of “Dream BIG” because they know there’s a BIG Plan for everyone’s life, and no one should settle for less!! !